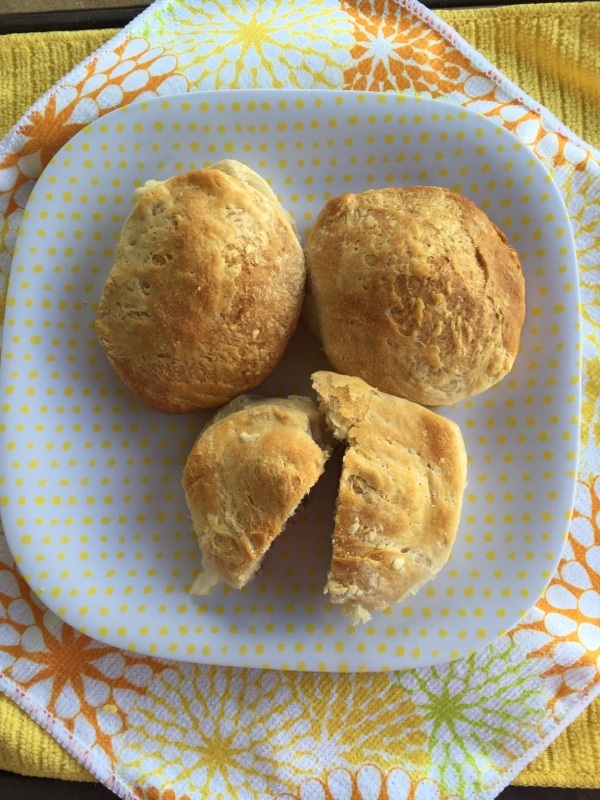 Stuffed Biscuits – Mama, Can I Lick the Spoon? We are definitely a breakfast family. Eggs, bacon, sausage, pancakes, waffles, grits (well, Michael hates grits), oatmeal (Elizabeth hates oatmeal). We love breakfast. The kids and I would eat breakfast for dinner on a regular basis, but Michael has some moral directive against it. 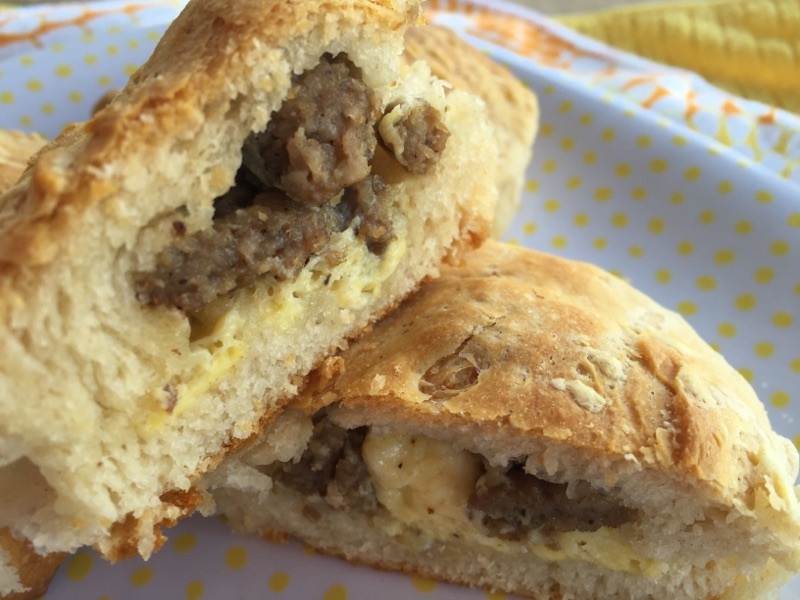 These are biscuits stuffed with scrambled eggs and sausage! And even though you may be thinking, “Nope. Too much work!”, they really weren’t that much work at all! I promise! In a large skillet, crumble the sausage and cook over medium-high to high heat until browned. Drain the sausage on a paper-towel-lined plate or bowl. In the same skillet, melt the butter. Whisk the eggs with 1/2 teaspoon of salt and a pinch of pepper. Pour into the skillet with the melted butter and use a rubber spatula to stir the eggs. 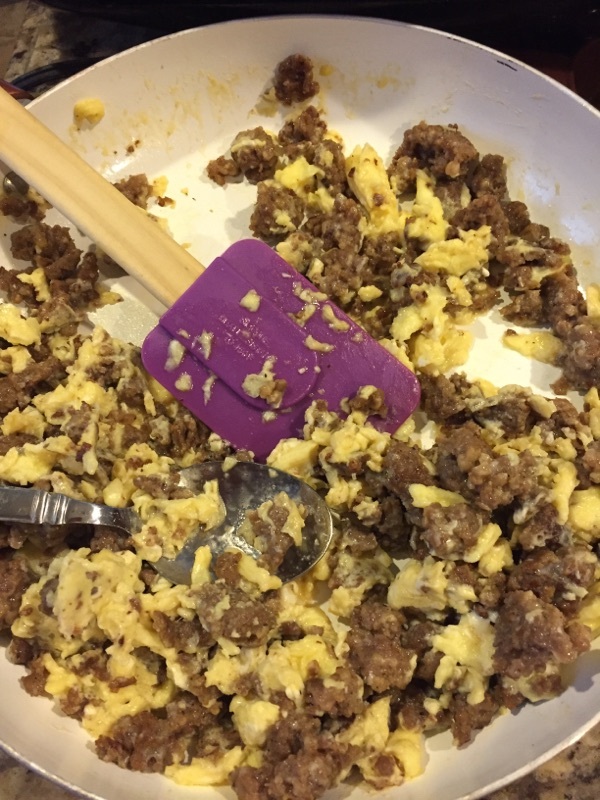 After about a minute, add the cooked sausage crumbles into the eggs and scramble the mixture altogether until eggs are cooked. Remove from the heat and allow to cool for a few minutes. Take each biscuit and use your fingers to gently separate the layers at about the halfway point. Be careful not to tear the biscuits. 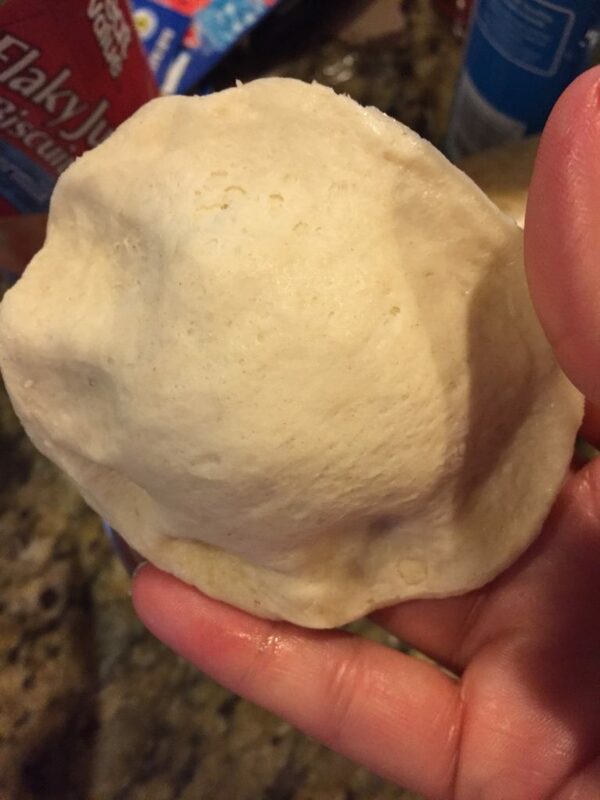 Use a spoon to stuff some of the egg mixture into the biscuit. 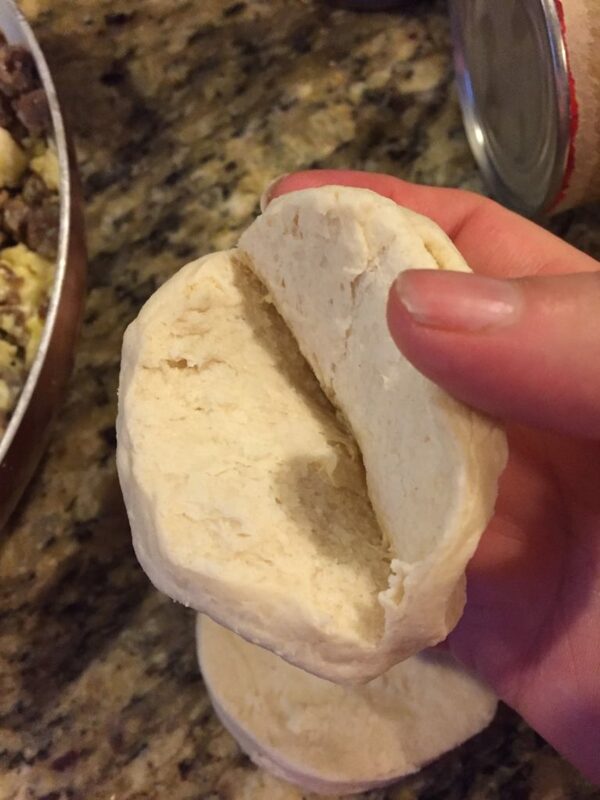 And then stretch the biscuit a little to enclose the stuffing inside and pinch the edges shut. Place each finished biscuit on the prepared baking sheet and continue until you’ve used all of them. There may be a little extra filling left over. It’s okay. Just eat it. Bake for 25-30 minutes – or until golden brown. Look how sweet they look all snugged up against each other! Remove them from the oven and let them cool for about 5 minutes before serving. Well Duh #1: You have to use the flaky-style biscuits. And you have to use the big ones. You know, the really GRAND ones! Well Duh #2: You can absolutely add a cup or so of shredded cheddar to the filling mixture. I just didn’t have any! Well Duh #3: If you do accidentally tear one of the biscuits, just do your best to pinch it back together and then place the biscuit tear-side-down on the baking sheet. Well Duh #4: I actually cooked the sausage the night before and put it in the refrigerator in a covered dish. That made this process go a lot quicker! We all really loved these! Everybody came up with an idea for making them a little different next time: use bacon instead of sausage; add cheese; make white gravy to smother them in; use them in a non-breakfast way (like stuffing them with shrimp or crawfish). 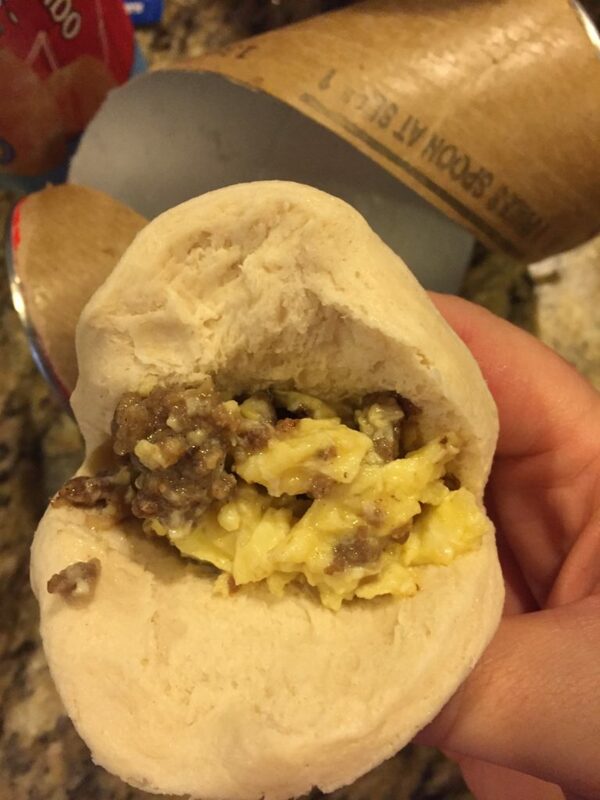 These are a delicious, filling, and portable breakfast! However we have them, I’m pretty sure we’ll love them! This is definitely my kind of breakfast! And good for on the go. Does it reheat well? Yes! I reheated a couple in the microwave wrapped in a damp paper towel. Of course, they reheat best in the oven, but that’s not always an option!